- Take 1-70 to Exit 148 (US-54). 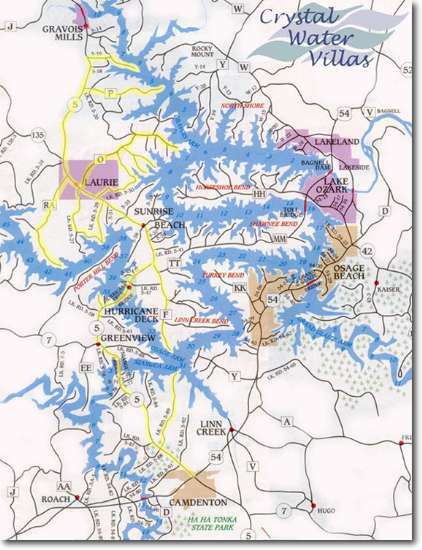 Go south on Hwy 54 for 70 miles toward the towns of Rocky Mount, Lake Ozark, Osage Beach, Lynn Creek and Camdenton. Approximate driving time from Kansas City or St. Louis to the Lake of the Ozarks is 3 1/2 hours. - Take I-44 East to Exit 129 (MO-5) and go north for 21 miles into the town of Camdenton. 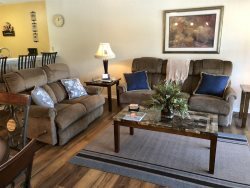 CWV Office - Our office is located 6 miles outside of Laurie on Lake Road O and our premier vacation rental homes and condominiums reside all over the Lake of the Ozarks. Detailed directions on our reserved vacation properties will be sent via email upon receipt of your reservation.